Feb. 28, 1993: A gun battle erupted near Waco, Texas, when Bureau of Alcohol, Tobacco and Firearms agents tried to serve warrants on the Branch Davidians; four agents and six Davidians were killed as a 51-day standoff began. Pakistan’s Ministry of National Health Services, Regulations and Coordination has reported cases of Chikungunya in the country for the first time. 27 February 2017 – Pakistan’s Ministry of National Health Services, Regulations and Coordination has reported cases of Chikungunya in the country for the first time. A total of 803 cases have been reported since 19 December 2016 in the Sindh province, including 29 cases reported in various towns in Karachi during the week of 10-16 February 2017. Of the 92 samples sent to the National Instituted of Health for testing, 71 have been laboratory-confirmed postive for Chikungunya virus. WHO is in close coordination with the Ministry of Health and partners in response efforts. Capacity-building has been conducted and instructions issued to district and town health officers, primary health care providers and hospitals on Chikungunya treatment and preventative measures. The community has been advised through a door-to-door campaign through the Lady Health Workers programme. Affected areas have been fumigated and high-risk areas have been treated with insecticides using indoor residual spraying. The World Health Organization was requested by Member States to develop a global priority pathogens list (global PPL) of antibiotic-resistant bacteria to help in prioritizing the research and development (R&D) of new and effective antibiotic treatments. WASHINGTON, Feb. 22, 2017 – Acting Deputy Agriculture Secretary Michael Young today announced U.S. Department of Agriculture (USDA) is investing up to $103 million in fiscal year 2017 for disaster recovery efforts to help state, local and tribal units of government protect lives and property in disaster-affected areas following natural disasters. Local units of government, or sponsors, will use financial and technical assistance from the Emergency Watershed Protection Program (EWP Program) to carry out much-needed recovery projects to remedy damages caused by natural disasters such as floods and hurricanes. Nearly $9 million will be used to fund disaster recovery projects, such as debris removal and streambank stabilization, in Florida, Georgia, North Carolina and South Carolina that will repair damages caused by Hurricane Matthew, a powerful storm that roared up the East Coast in late September through early October 2016. Up to 70 percent of this fiscal year’s financial assistance funding will be used by USDA’s Natural Resources Conservation Service (NRCS) to purchase floodplain easements in Louisiana. In August 2016, severe flooding devastated sections of two of Louisiana’s largest cities—Baton Rouge in southcentral Louisiana and Shreveport in northwestern Louisiana. Congress designates funding for the EWP Program. The fiscal year 2017 funding is included in the continuing resolution signed by Congress in early December 2016 to keep the federal government operating through April 2017. Initial funding requests and projects approved for the five states are included below. States will continue to submit requests for EWP disaster recovery assistance and the remaining funds will be used to help communities cope with the adverse impacts from existing and future natural disasters. Louisiana – $65 million for the purchase of floodplain easements on private land owned by individuals and public land owned by local, state and tribal governments after severe flooding adversely impacted eastern Louisiana in August 2016. In the city of Baton Rouge, approximately 30 homes in a development in Livingston Parish and about 20 homes in Pointe Coupee Parish will be demolished and the flood-prone land restored to its natural condition. Signups will be held in the two areas to enroll the land into the EWP-floodplain easement option. Florida – up to $3.1 million for disaster recovery projects to address impacts and damages from Hurricane Matthew including debris removal in Putnam and Volusia counties and channel bank stabilization in Brevard County. Georgia – up to $97,000 for projects to address impacts and damages from Hurricane Matthew including debris removal in Brantley County. North Carolina – $908,000 for projects to address impacts and repair damages caused by Hurricane Matthew including sediment removal and streambank stabilization to protect roads and a waste water treatment plant in eastern North Carolina. South Carolina – up to $5.7 million for projects to address impacts and damages from Hurricane Matthew including debris removal in the counties of Beaufort, Charleston and Horry; towns of Hilton Head Island, Mount Pleasant and Summerville; and Horse Range Watershed Conservation District in Orangeburg County. The EWP Program helps communities carry out much-needed recovery projects to address damages to watersheds caused by hurricanes, floods, fires, windstorms, wildfires and other natural disasters. EWP offers two options— disaster recovery and permanent floodplain easements. Privately-owned land or public lands owned by local, state or tribal units of government are eligible for USDA assistance through the EWP Program. NRCS provides 75 percent of the funds for recovery projects and the public entity pays the remainder in cash or in-kind services. Floodplain easements are purchased and held by the USDA NRCS. Landowners are compensated for the surface easement and retain ownership of the properties enrolled. On Feb. 26, 1993, a bomb exploded in the garage of New York’s World Trade Center, killing six people and injuring more than 1,000 others. 21 were transported by ambulance to seven area hospitals: University Medical Center, Tulane Medical Center, Tulane Lakeside, Touro Hospital, East Jefferson General Hospital, Ochsner Main Hospital, and Ochsner Baptist Hospital. New Orleans Police Department Chief Michael Harrison said one person is in custody and he is being investigated for driving while intoxicated. Police do not suspect terrorism. Togo: Since 1 January 2017, 201 suspected cases of meningitis with 17 deaths were reported by 19 health districts. Since 1 January 2017, 201 suspected cases of meningitis with 17 deaths were reported by 19 health districts. In week 2, the district of Akebou which is part of the Plateau Region issued an alert after four cases of meningitis were reported. In week 4, the epidemic threshold was reached with nine cases and an attack rate of 12.4 per 100 000 inhabitants. From 2 January to 12 February 2017, 48 suspected meningitis cases with three deaths were reported (case fatality rate of 6.3%). Of these, 14 specimens were confirmed as Neisseria meningitidis serogroup W by PCR. The Plateau Region, together with the other three regions in the country benefited from the mass vaccination campaign with MenAfriVac in December 2014. Togo is part of the African meningitis belt and documents cases and deaths due to meningitis every year. In 2016, the country recorded an epidemic in the northern part caused by Neisseria meningitidis serogroup W. A total of 1975 cases and 127 deaths were reported in 2016. 56 000 doses of meningitis vaccines have been requested from the International Coordinating Group (ICG) for the planned vaccination campaign. WHO Field Mission was deployed in the field to strengthen outbreak management. Strengthening of meningitis surveillance at the district level. Training of clinicians at the district level on case management. Conducting cross-border meetings with Ghana and Benin. The largest burden of meningococcal disease occurs in the African meningitis belt. Although the successful roll-out of MenA conjugate vaccine has resulted in the decreasing trend of meningitis A, other meningococcal serogroups are shown to have caused epidemics. This report of the Neisseria meningitidis W outbreak in Togo calls for a close monitoring of the changing epidemiology of meningococcal disease. There is a need to ensure that global stocks of vaccines are available, laboratory and epidemiologic surveillance systems are strengthened and outbreak response strategies in the countries are on hand. The epidemic response consists of prompt, appropriate case management involving reactive mass vaccination of populations, and strengthening of meningitis surveillance. 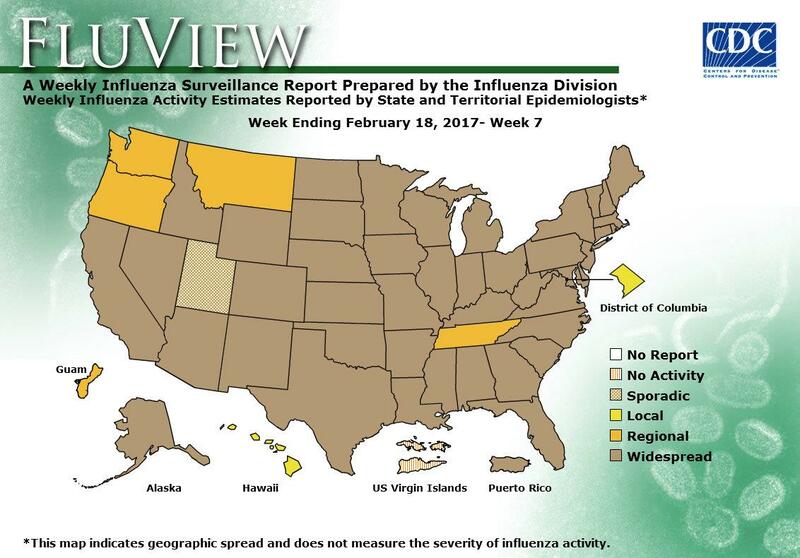 During week 7 (February 12-18 2017), influenza activity decreased slightly but remained elevated in the United States. Viral Surveillance: The most frequently identified influenza virus subtype reported by public health laboratories during week 7 was influenza A (H3). The percentage of respiratory specimens testing positive for influenza in clinical laboratories decreased slightly but remained elevated. Pneumonia and Influenza Mortality: The proportion of deaths attributed to pneumonia and influenza (P&I) was above the system-specific epidemic threshold in the National Center for Health Statistics (NCHS) Mortality Surveillance System. Influenza-associated Pediatric Deaths: Five influenza-associated pediatric deaths were reported. Influenza-associated Hospitalizations: A cumulative rate for the season of 33.7 laboratory-confirmed influenza-associated hospitalizations per 100,000 population was reported. Outpatient Illness Surveillance: The proportion of outpatient visits for influenza-like illness (ILI) was 4.8%, which is above the national baseline of 2.2%. Nine regions reported ILI at or above their region-specific baseline levels. 27 states experienced high ILI activity; New York City and five states experienced moderate ILI activity; Puerto Rico and 10 states experienced low ILI activity; eight states experienced minimal ILI activity; and the District of Columbia had insufficient data. Geographic Spread of Influenza: The geographic spread of influenza in Puerto Rico and 44 states was reported as widespread; Guam and four states reported regional activity; the District of Columbia and one state reported local activity; one state reported sporadic activity; and the U.S. Virgin Islands reported no activity. 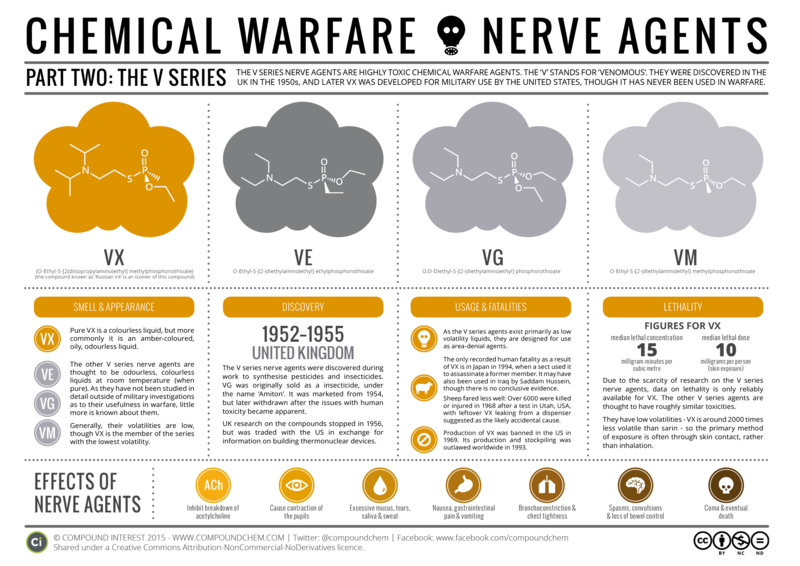 Malaysian Police: The poison used to kill Kim-Jong-nam, the brother of the North Korean leader Kim Jong-un, was VX nerve agent, a substance listed as a chemical weapon.